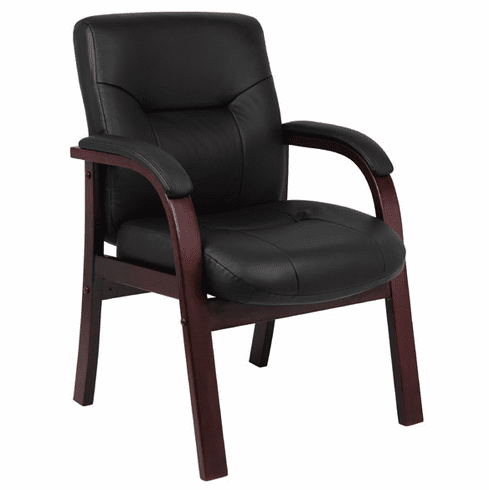 Boss Executive Leather Guest Chair [B8909] Free Shipping! This executive leather guest chair is beautifully upholstered in genuine black Italian leather. Features built in lumbar support and rich mahogany finish hardwood arms and base with tailored leather padding to give your home or office a distinguished look. Meets and or exceeds ANSI/BIFMA standards. Dimensions: Seat Size: 21"W x 20.5"D. Back Size: 22"W x 21"H. Seat Height: 18"H. Fully warranted by Boss Office Products. This leather guest chair normally ships within 2-3 business days from our GA or CA warehouse.